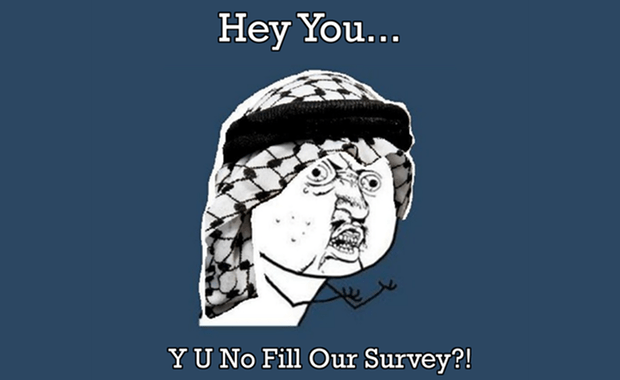 I’ve been wanting to use the “Arabic” Y U No Guy for a while now and I finally have the chance, I don’t think there’s a greater call to action then an illustration of guy in a Shemagh (aka Keffiyeh)! Anyways… On to more serious matters, this month has had a lot of firsts for us and we’re going ahead and adding another one. We’re carrying out a survey that should hopefully shed more light on the region’s use of web, social, mobile and how people behave online in general. The reason we’re doing this is because anybody who tried searching for content regarding these subjects in the region probably realized how scarce the information is, and after trying many times to get information from different sources we finally decided to get it our own way. Although we’re mainly focusing on users from the UAE, all readers are welcome to fill out and share the Online, Social Media & E-Commerce usage in the UAE survey, it shouldn’t take more than 5 – 10 minutes. And here’s the best part, its FREE all the results will be published in month’s time (give or take) to everybody. It’s our way of giving back the web in the MENA region. I’d also like to take a moment to thank the ladies at Purple PR for their great work and help on this little project. If you like what we’re doing please fill and share the survey, if not, or have any different ideas you’d like to explore get in touch and let us know. The ad is too awesome !! Thanks Aisha! We're trying our best! !